The plane was located yesterday morning. 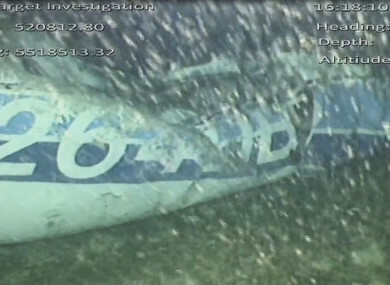 ONE OCCUPANT OF the plane that was carrying footballer Emiliano Sala can be seen in the wreckage, investigators have said. The wreckage was found yesterday as part of a private search launched by the 28-year-old’s family. Sala was flying from France to join his new club Cardiff City when the light aircraft he was travelling on disappeared on 21 January north of the island of Guernsey. Shipwreck hunter David Mearns, who was hired by the striker’s family after the official rescue effort was called off, said the plane was found yesterday morning. “It is broken but most of it is there,” he told BBC radio. Today the UK’s Air Accidents Investigation Brance (AAIB) said video footage from the seabed confirmed the wreckage is that of the missing Piper Malibu aircraft. “Tragically, in video footage from the ROV, one occupant is visible amidst the wreckage. The AAIB is now considering the next steps, in consultation with the families of the pilot and passenger, and the police,” it said in a statement. The board released an image today showing the rear side of the fuselage. Mearns said his private company, Blue Water Recoveries, had found the wreckage before calling in the AAIB to take a closer look. “They dove with their remotely operated vehicle, that’s a submersible with cameras and lights, and indeed confirmed that it was the plane,” he said. - © AFP 2019 - with reporting by Michelle Hennessy. Email “'One occupant visible' in wreckage of Emiliano Sala plane ”. Feedback on “'One occupant visible' in wreckage of Emiliano Sala plane ”.